Castellorizo is an island in the Dodecanese group lying off the coast of Asia Minor about 60 miles east of Rhodes. Italy was given responsibility for it after World War I. 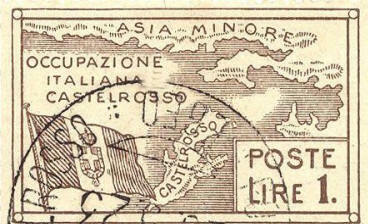 In 1923 Italy issued a set of five stamp featuring a map of the island. The image on this page is in the public domain, and has been downloaded from Wikipedia Commons. It is identified in the Scott catalog as Castellorizo 60 (1923).